Interesting matches of Indian Premier League started on 3rd April. on first three days only one match was played everyday but from Saturday 6th April 2013 we will see two matches everyday which means double entertainment. On 6th April in 1st Match DD Delhi Daredevils will take on RR Rajasthan Royals that will be second match of Delhi and 1st match of Rajasthan. Delhi lost their first match to Kolkata by 6 wickets. both Delhi and Rajasthan are strong teams packed with great players. 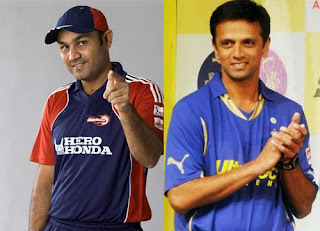 Captain of RR is Rahul Dravid. Shane Watson, Shaun Tait, Brad Hogg and Ajinkya Rahane are some other big players in the team. on other side Delhi got Jayawardena as captain. other good players include Sehwag, Morkel, David Warner, Irfan Pathan. so we can expect a interesting match between both sides. this match will start at 3:30 PM tomorrow.